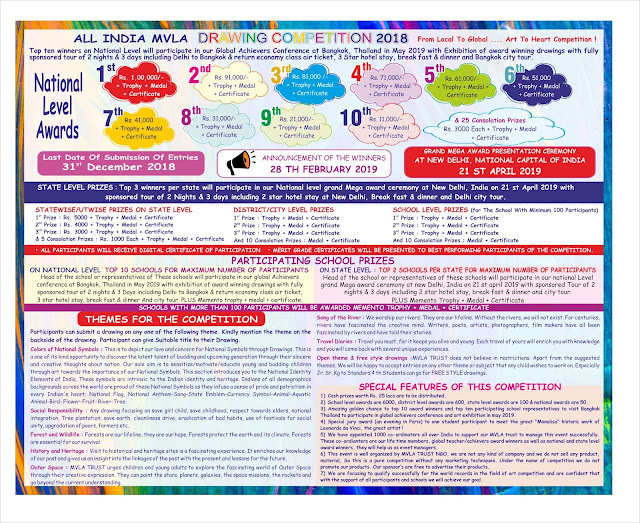 MVLA Trust is organizing all India drawing competition named "ALL INDIA MVLA DRAWING COMPETITION 2018" for children from playgroup to class 12th to enhance children's creativity as art allows them to express, explore, experiment and expand which creates an individual a confident, patient, innovative and visionary person of the society. MVLA Trust invites students from schools across India and Indian schools abroad India to showcase their passion for drawing & art by participating in this most colorful National level drawing competition. Cash prizes worth Rs. 25 lacs are to be distributed. School level awards are 6000, district level awards are 600, state level awards are 100 & national awards are 50. Amazing golden chance to top 10 award winners and top ten participating school representatives to visit Bangkok Thailand to participate in global achievers conference and art exhibition in may 2019. Special jury award (an evening in Paris) to one student participant to meet the great "Monalisa" historic work of Leonardo da Vinci, the great artist ! Colors of National Symbols : This is to depict our love and concern for National Symbols through Drawings. This is a one of its kind opportunity to discover the latent talent of budding and upcoming generation through their sincere and creative thoughts about nation. 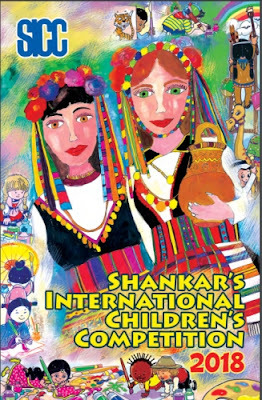 Our sole aim is to sensitize/motivate/educate young and budding children through art towards the importance of our National Symbols. This section introduces you to the National Identity Elements of India. These symbols arc intrinsic to the Indian identity and heritage. Indians of all demographics backgrounds across the world are proud of these National Symbols as they infuse a sense of pride and patriotism in every Indian's heart. National Flag, National Anthem-Song-State Emblem-Currency Symbol-Animal-Aquatic Animal-Bird- Flower-Fruit- River-Tree. Social Responsibility : Any drawing focusing on save girl child, save childhood, respect towards elders, national integration, Tree plantation, save earth, cleanliness drive, eradication of bad habits, use of festivals for social unity, up gradation of poors, farmers etc. Forest and Wildlife : Forests are our lifeline, they are our hope. Forests protect the earth and its climate. Forests are essential for our survival. History and Heritage : Visit to historical and heritage sites is a fascinating experience. It enriches our knowledge of our past and gives us an insight into the linkages of the past with the present and lessons for the future. Outer Space : MVLA TRUST urges children and young adults to explore the fascinating world of Outer Space through their creative expression. They can paint the stars, planets, galaxies, the space missions, the rockets and go beyond the current understanding. Song of the River : We worship our rivers. They are our lifeline. Without the rivers, we will not exist. For centuries, rivers have fascinated the creative mind. Writers, poets, artists, photographers, film makers have all been fascinated by rivers and have told their stories. Travel Diaries : Travel you must, for it keeps you alive and young. Each travel of yours will enrich you with knowledge and you will come back with several unique experiences. Open theme & free style drawings : MVLA TRUST does not believe in restrictions. Apart from the suggested themes, We will be happy to accept entries on any other theme or subject that any child wishes to work on. Especially Jr. Sr. Kg to Standard 4 th Students can go for FREE STYLE drawings. Student should draw the drawing on A3 size paper (paper size minimum 11 by 16 inches). Students can use whatever the color type they wish to use (i.e. Water color, pencil color, oil colors, sketch pens/pencils etc.) All the related materials like drawing paper, pencil, eraser, colors, drawing board etc. Will be arranged by the participant only. Student can draw the picture at his/her school and submit to their teachers, head of the schools/principals or co-coordinators of MVLA trust. 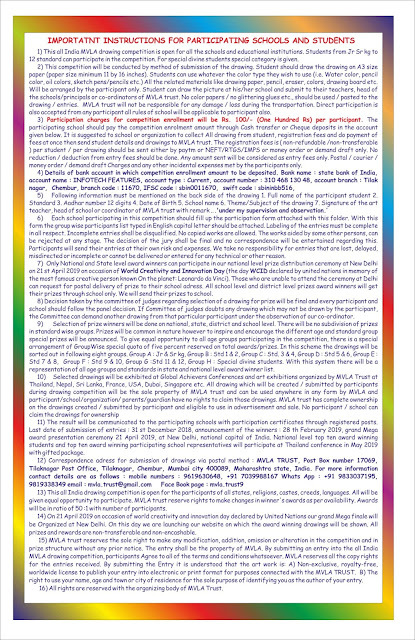 No color papers / no glittering glues etc., should be used / pasted to the drawing / entries. 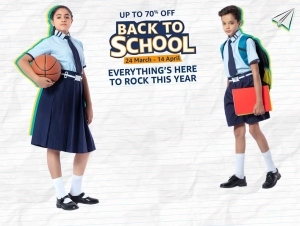 Direct participation is also accepted from any participant all rules of school will be applicable to participant also. Participation charges for competition enrollment will be Rs. 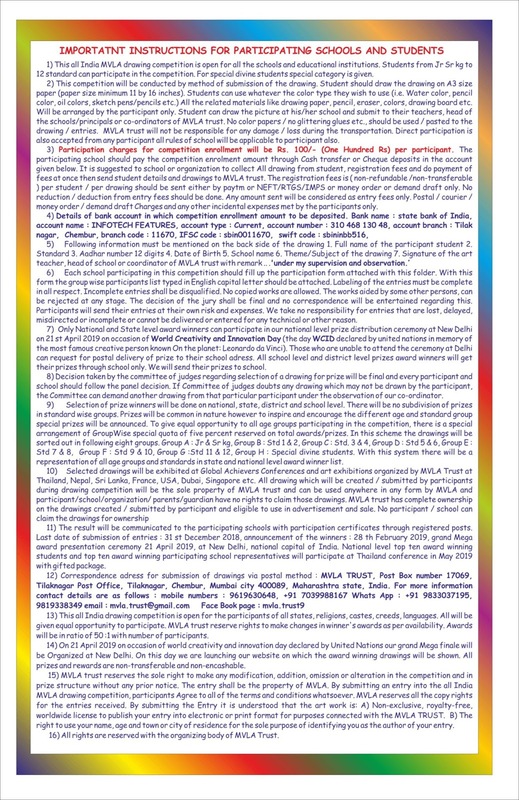 100/- (One Hundred Rs) per participant. Hello..Where do I send the entry.No information provided.. Result of All india MVLA drawing competition,please?